Winnebago Industries has launched an all-electric commercial vehicle. 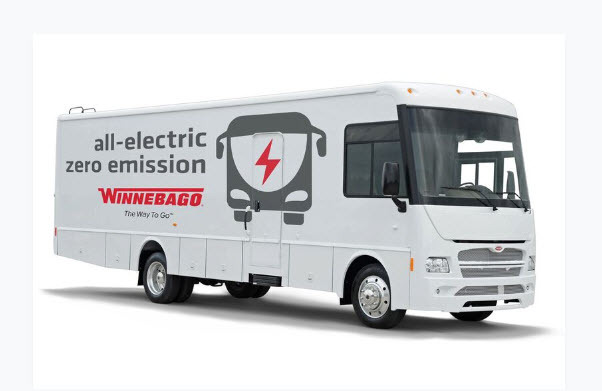 FOREST CITY, IOWA, May 01, 2018 (GLOBE NEWSWIRE) -- Winnebago Industries, Inc. (NYSE:WGO), a leading United States (U.S.) recreation vehicle manufacturer, has announced the launch of an all-electric/zero-emission commercial vehicle platform through the Company's Specialty Vehicles Division. In conjunction, the Company has announced a strategic partnership with Motiv Power Systems, Inc., a U.S. market leader in chassis for medium-duty electric vehicles, for the development and supply of electric-powered chassis. As part of the strategic partnership, Winnebago intends to make a financial investment in Motiv, the terms of which were not disclosed. "Winnebago Industries is a company that is focused on creating customer value through innovation and technology," said Ashis Bhattacharya, Vice President, Strategic Planning and Development, and leader of the Specialty Vehicles Division. "We have a rich history of product and feature innovation, and we are continuously evaluating new and emerging technologies to further that legacy. We believe that all-electric vehicle applications continue to evolve to serve numerous end-user needs and this is our first step as a participant in this space." Winnebago Industries has been a leading supplier of specialty and custom-built vehicles for more than 30 years. Offerings include commercial shells, Ability Equipped motorhomes, and specialty vehicles. Every Winnebago Industries commercial vehicle features an interlocking SuperStructure design creating a barrier-free interior and allowing for maximum customization. Available options include slide rooms, alternate entrance door locations, wheelchair lifts and cargo doors. Other integrated systems can include: air-conditioning, generators, solar panels, inverters, power back-up systems, leveling systems, toilets, showers, and plumbing. Winnebago Industries' all-electric/zero-emission commercial vehicle is based on a Class A RV platform utilizing Motiv's Ford F53 based EPIC all-electric chassis and will be available in 33-foot and 38-foot lengths with a Gross Vehicle Weight Rating (GVWR) up to 26,000 pounds. The vehicle is suited for urban and semi-urban short range commercial applications like mobile medical clinics, bloodmobiles, mobile classrooms and mobile outreach vehicles. Significant road testing has been conducted on the vehicle that houses six to eight batteries and delivers an expected range of 85 to 125 miles on a full charge. "Motiv's EPIC all-electric chassis, paired with Winnebago Industries' highly regarded commercial shell, is the perfect fit for end-users who seek reliable performance and functionality," said Jim Castelaz, Motiv CEO & Founder. "We are excited to collaborate with Winnebago Industries as we work together to grow the electric commercial vehicle market."